The U.N. Human Rights Council has delayed the release of a blacklist of firms operating in Jerusalem and the West Bank. 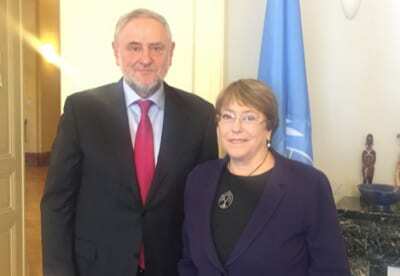 WJC CEO and Executive Vice President Robert Singer meeting with UN High Commissioner for Human Rights Michelle Bachelet on 12 February 2019. The move by High Commissioner for Human Rights Michelle Bachelet, citing the “complexity” of the job mandated in 2016 by the UNHRC, came amid outside pressure, including from NGO Monitor, which tracks nongovernmental organizations and how they view Israel. Although the World Jewish Congress applauded the development, it called for the initiative to be scrapped altogether. “While we appreciate her stance that time is needed to fully consider the input submitted and ensure that due process is respected, we underscore our position that this publication should not only be postponed but cancelled in its entirety,” said WJC CEO and executive vice president Robert Singer. The delay of the blacklist on Tuesday was not the UNHRC’s first. It was first delayed in February 2017 and again in January 2018.